Stepping off the plane at Tribhuvan International Airport in the Kathmandu Valley, one thing that becomes immediately apparent is the scale of the work still required to aid recovery in post-earthquake Nepal, and the shockingly limited reconstruction that has been achieved in the seven months since a 7.8 magnitude tremor shook this poverty-stricken country, claiming over 9000 lives, injuring 25000 more, and displacing nearly half a million. Livelihoods shattered, realities changed for ever. The short and long term effects of this disaster cannot be understated. The world is witnessing the disparate ramifications that arise when a disaster event strikes a particularly poor nation already in the midst of political and economic turmoil. One event feeds another, creating new humanitarian crises, in cycles that may continue for decades. The direct and indirect effects of the earthquake include: human trafficking, reduced labour cost and availability, rental and property cost burdens, unmanageable rates of urbanisation, significant private and public debt increases, psychological damage and distress, damage to tourism, increased exposure to water borne diseases, and serious damage to transport and sanitation infrastructure. In particular the passing of the constitution in the months since the earthquake has opened old wounds and caused new conflicts, both domestically and with neighbouring jurisdictions. These tensions have directly contributed to the recent blockade at the Indian border that has created a crippling shortage of fuel, cooking gas, medicines and other essential supplies. The international community must not fall under the misapprehension that, for a developing nation like Nepal, all that is in need of repair after a natural disaster is that which has been directly physically damaged by the event. The problems in this land are of a much more complex nature. Motorists queue for days in Nepal's capital Kathmandu waiting for fuel due to the ongoing fuel crisis following a blockade on the Indian border. As we move on to recount exactly what we got up to during our nine day field visit and our plans for the near future, please bear in mind the above as context for the true extent and impact of the recent earthquakes. As our arrival and departure point, the capital became the introduction and conclusion to our journey; a place to recharge batteries, review experiences and plot next steps. Most importantly though, this is where we made our connections with the local NGOs that are and will continue to be absolutely vital to our success in engaging in projects that benefit the people of Nepal. 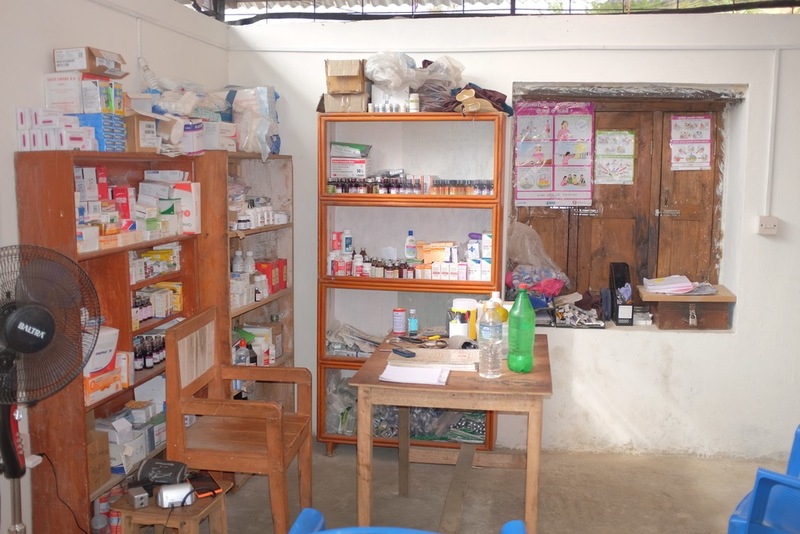 One of the six key values of our charity is grassroots engagement and we are fostering and nurturing our connections and working relationships with our chosen Nepali partners with care and commitment in order to facilitate the efficacy of our operations (the six values in full, in case you are interested, are - transparency, accountability, kindness, collaboration, interaction, and grass roots engagement). With this in mind, we dedicated our ‘free time’ in Kathmandu to meeting members from all three of the Nepali NGOs we were hoping to work with during this trip and beyond - CAP Nepal, Play for Deprived Children Nepal and Blind Youth Association Nepal (with an honourable mention also going to BASE - without whom none of this would have been possible from the beginning). Our meetings were without exception fruitful and productive and we found these experiences both encouraging and motivating. We are certain that the connections we have cemented via face to face meetings will be of great help as we continue to develop relationships, work together and help each other. Play for Deprived Children Nepal (PDCN) - T-shirts donated to a sports team, laptop donated for school use. 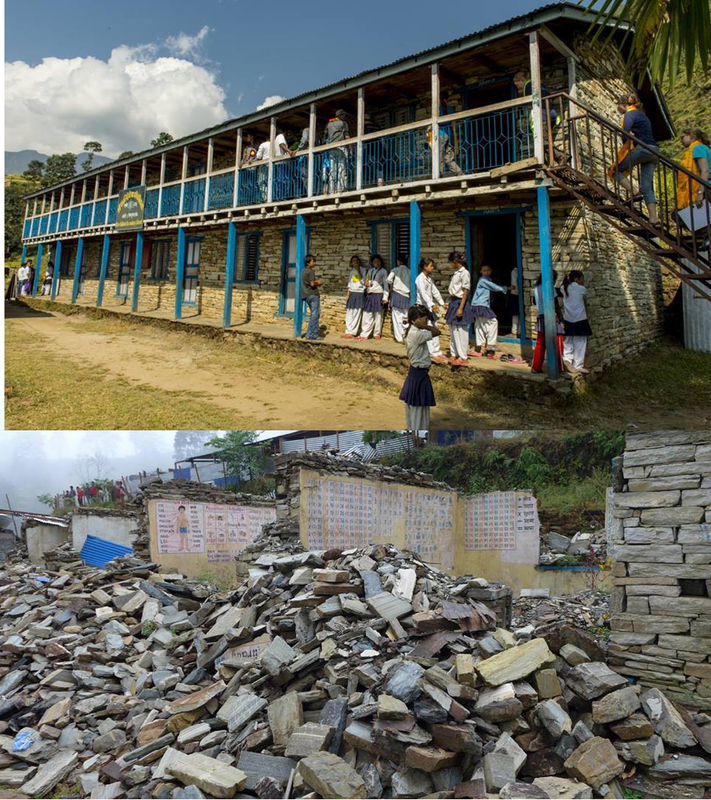 Second hand school books (approx 100) and sanitary pads (approx 1000) were also donated specifically to a school in Okhaldhunga - a region particularly badly-damaged by the earthquakes. This is part of a wider project run by PDCN to help a number of schools around the same region. PDCN focuses on using sports and play to improve education and health standards in Nepali schools. We were also motivated by the female empowerment element of the initial grant (through the provision of sanitary pads) and this is something we are hoping to focus on more and more. Blind Youth Association Nepal (BYAN) - We supplied funding for one blind volunteer to be trained as a counsellor in order to provide therapeutic assistance to other blind persons traumatised by the earthquake. BYAN is a national self-help NGO that has the overall aim of promoting a dignified life for blind and partially sighted youths (under 35) in Nepal. Since the disastrous earthquakes, their primary focus has become assistance and education of blind people (and those that are around them) with regards to earthquake preparedness, accessible schools (that are also easy to evacuate) and repairs to schools that include blind students among their number. They have a target list of 15 different schools all across Nepal and we aim to support them throughout this project. One particularly under-appreciated effect of a huge disaster like this is the long-term psycho-social impact and trauma experienced by the blind students. This can prevent them from returning to school due to the fear that something similar might happen again. Hearing first-hand testimony of these effects during our meeting, we decided that our first grant to this wonderful organisation should be the counselling training for one of their blind/partially-sighted volunteer staff. We COULD NOT have achieved the above without our wonderful donors and supporters. We also WILL NOT be able to realise our goals of continuing to fund our local partners without your continued support. If you can help with a monthly or one-off donation, please visit our website here. Your generosity is massively appreciated by us and our friends in Nepal. One of the key objectives of our trip was revisiting the villages of Gati & Mandra – both of which were a focus of our earliest projects and are home to the child artists who painted the beautiful artworks we auctioned off in early November. We made a commitment that all the funds raised from that auction would be used to directly help the same children's communities. The generosity of our extended friends and family on the evening was astounding, and we ended up raised nearly £2000. This amount of money can really change lives in Nepal. Signs of destruction can be seen far and wide along the road from Kathmandu, including the long term damage from past disasters: Like this particularly grim sight of a giant landslide from August 2014 that killed over 150 locals (up to 100 bodies are still trapped beneath the mud and rubble) and blocked the nearby river, flooding a number of homes. 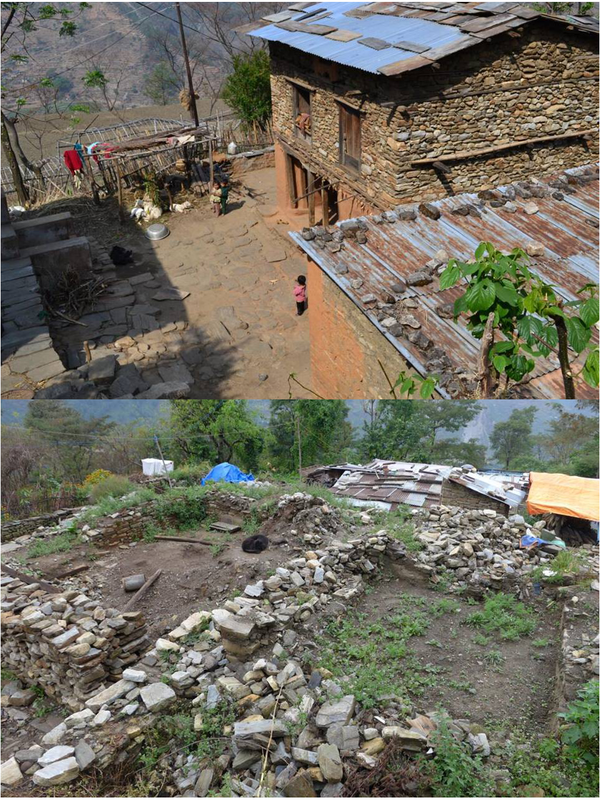 Even seven months after the earthquake, most of Gati & Mandra villages still lie in ruin and families are forced to live in temporary shelters – progress has been very slow and meaningful assistance from the government has yet to materialise. Only the actions of other small dedicated charities and, in particular our friend guide and mentor, Beebal Singh Limbu, have contributed to important redevelopment efforts. Harnessing his contacts with Western tour clients and other private donations, Beebal, alongside community coordinator Sanjay Thamel, oversaw the building of a modern health centre in a mere two weeks – now manned by trained staff, fully stocked with medicines, beds, IV drips and quarantined areas. The beds were empty when we arrived, so the centre handily doubled as the base of operations during our stay. The surrounding natural beauty of this region is astonishing but the majority of our time was spent appreciating the everyday lives of the local people and in particular the effervescent, energetic and excitable young children. With the school supplies and games we had purchased in Kathmandu we ran a number of popular English language and ‘Art’ (read: colouring in) lessons, as well as annoying the adult population by teaching the kids how to make paper aeroplanes and inadvertently distributing lollipops that doubled as offensively noisy whistles. The charming children of Mandra village greet us good morning. End of the lesson students are given lollipops.... turns out they also double as whistles! We held a clothing raffle up in Mandra village in order to fairly distribute the clothing donations we were able to take with us. The process became quite an event in the village, as everyone gathered around to join in the excitement – cheering each time somebody’s name was pulled out of the hat. We were kindly hosted by the unreasonably hospitable and welcoming Shreshta family. 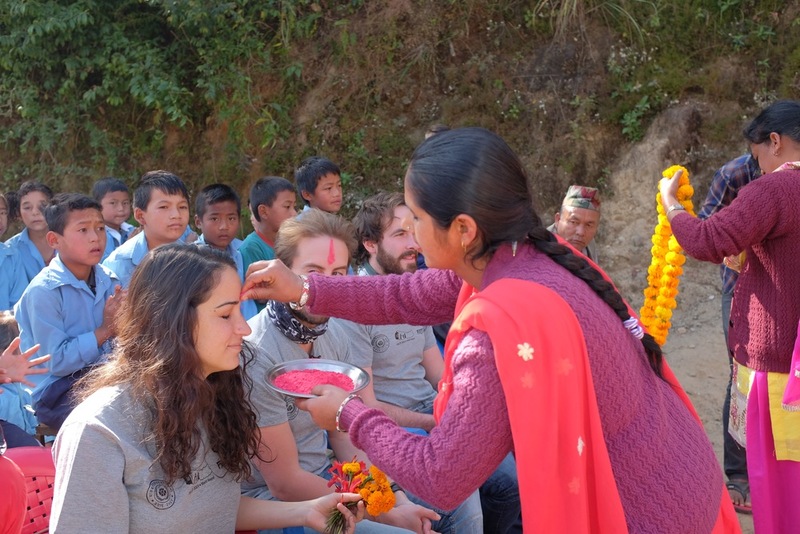 Two or three occasions each day we were treated to delicious, authentic Nepali cuisine, alongside a healthy (or perhaps unhealthy) serving of moonshine. The caring mother was particularly warm-hearted and made a great impression on all of us. Especially when she began to tell us heartbreaking stories about her 17 year old son who died during the earthquake. 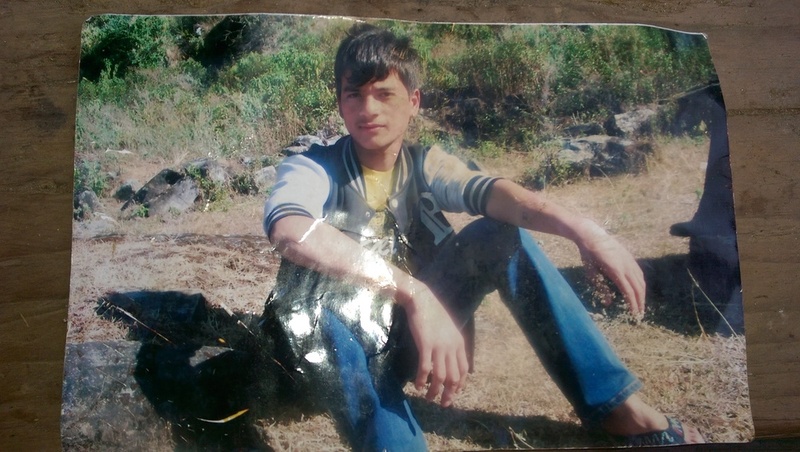 He was killed rescuing his two month old nephew from a crumbling house. His nephew survived and is now approaching his 1st birthday, for now still unaware that his young uncle paid the ultimate sacrifice so that he could still be here today. One evening, we brought out a laptop with photos from the London auction of the local children’s paintings. The whole village gathered around a tiny screen to see their work being considered and purchased (for large amounts of money) by caring strangers in a strange land half-way across the globe. During this presentation Beebal announced to the villagers that the funds raised from the sale of their paintings would finance the building of a Library Learning Centre in the middle of the village, and this Community Building would be named in memory of the brave young man who gave his life to save his nephew. There were tears, warm hugs, sincere thanks, a deep connection and gratitude on both sides: A moving and memorable experience none of us will never forget. Especially because we were simply the messengers. The real heroes, the true positive change-makers, are our donors and supporters – none of this would have been possible without you, so again, thanks so much. The Library Learning Centre will provide books, laptops and overnight stay facilities for students who have to walk from remote villages to attend school. The facility will also double as a valuable space for local people to hold public meetings and host traditional ceremonies. In addition, NERF will be able to use the building as a base to continue delivering projects, monitoring results and improving resources. Before we sign off, just to return briefly to something mentioned earlier in the blog – our field trip to donate school bags with CAP Nepal. During one of our first Kathmandu meetings, we agreed to fund the provision of brand new school bags (and stationery) to one of the schools focused on by CAP Nepal in their mission to improve living standards (particularly focusing on children), promote economic development, social progress and environmental conservation throughout Nepal. Our friends from CAP Nepal, President Purushottam and Secretary Uday Theeng, casually inquired whether we would like to attend the school to witness the distribution of the bags. Expecting just that - a low-key day out where we would meet some of the kids to benefit from our donation - we enthusiastically agreed. Nothing could have prepared us for the actual experience though. Firstly, the school was reached by another long two hour drive out of Kathmandu on normal roads, and then a further half hour of extreme 4x4 off-roading. The school was more remote than expected. It's a very bumpy ride en route to a remote school in the Kathmandu Valley! As we arrived we were greeted by two lines of students forming a tunnel - a really sweet touch as we were funnelled through the middle and welcomed with flowers from each individual child. Things got even more impressive as we turned the corner at the end of the tunnel: A temporary auditorium had been set up with a stage and PA system, a large banner celebrating Universal Children’s Day (complete with NERF logo) and all of the parents along with the rest of the village had turned out to spectate. What followed was an astonishing two-hour long celebration and cultural ceremony: Numerous thankful speeches (including one from NERF’s own Alba Gomez), traditional dances, folk songs, typical delicious grub and more sweet-smelling Marigold necklaces than could comfortably be worn around a single neck. We had grown used to Nepalis going that extra mile when it came to hospitality, but this was beyond anything we could have imagined. The sheer effort, the amount of time put in, the boundless positive energy and the never-ending smiles were really overwhelming. Humbled is beyond an understatement. All this before we’d even reached the pinnacle of the event. The distribution of a new school bag filled with stationery for each of the 62 students. The benefits of this donation are two-fold really: Replenishing supplies and providing kit that were destroyed in the earthquake, but also giving the children something to be proud of. The success of the latter was immediately apparent as each kid ran back to their parents to show off their brand new rucksack. We only wished we could have done more at the time, but have consoled ourselves with a commitment to raise more funds in the coming months so we are able to to increase our involvement as soon as possible. All the relatively small contributions we made on this trip are just the first steps in what we are already working hard to ensure become long and fruitful local partnerships that really benefit those most in need. We have many more fundraising events to announce in the coming weeks, and trustee David will be heading back out to Nepal long term in the New Year to coordinate further projects on the ground. As mentioned before, we couldn’t have achieved anything without you - our wonderful and selfless donors and supporters. Each of the donations we committed during this trip is simply the start of a much bigger project. 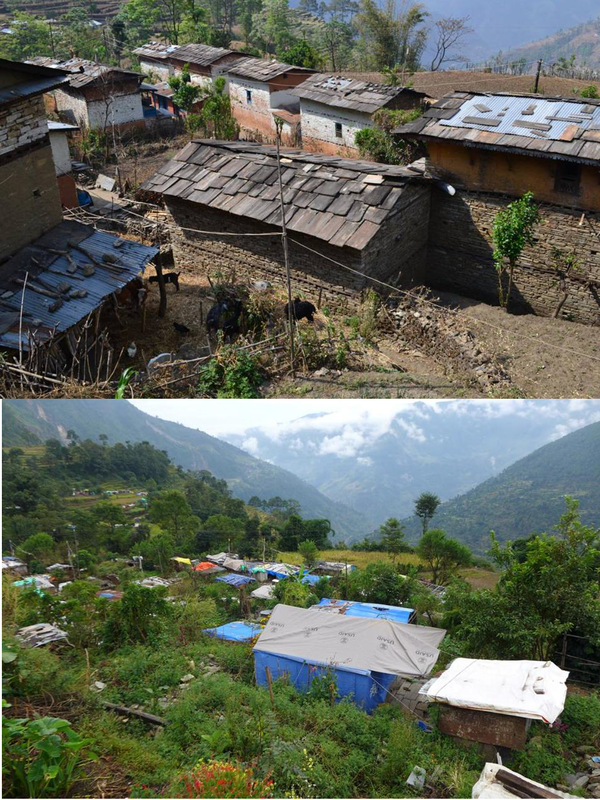 Every one of our partners - CAP Nepal, PDCN, BYAN, BASE, Gati Village - has a long term plan for continued and sustainable redevelopment and recovery in each of their chosen fields. We intend to continue to help these brilliant and vital local NGOs in their valuable work. But in order to do that we need your continued support. If you can help with a donation, please visit our website here. A donation of £10 would make a huge difference to our work, especially if you can make it a recurring monthly contribution which allows us to confidently plan ahead and budget for the future. Thank you, as always, for your time, your attention and your kindness.